Sri Lanka is increasingly gaining popularity as a major spot for watching whales because its coastline falls within a major whale and dolphin migration route. Especially West and Southern coast of Sri Lanka is very close to whale migration routes, making it the ideal place to watch whales. 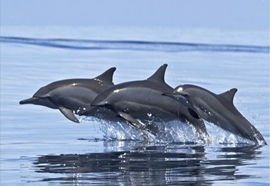 The major ports of whale and dolphin watching in Sri Lanka include the east coast of Trincomalee, remote locations in Alankuda beach in Kalpitiya in the West coast and Mirissa or Dondra Point down south. In addition, the western coastal cities of Alutgama, Ambalangoda and Hikkaduwa also offer whale and dolphin sightings.